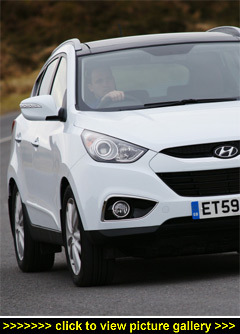 HYUNDAI, WITH ANOTHER RECORD YEAR of UK sales under their belt, see the ix35 as part five-door coupe, part SUV (because of its chunky looks, high off the ground stance and its two- and four-wheel drive options), part MPV because of its versatile seating and load carrying options and part family hatchback because it takes up about the same amount of road space. That's a lot of parts and raises the question  is the sum of its parts worth more than the whole? In pure sales terms the crossover segment has been a sales success and the top-selling Nissan Qashqai  which pioneered the concept  has appeared in the UK's new car sales top ten chart for almost all of 2010. With annual sales in excess of 37,000, the Qashqai has outsold all SUVs, all MPVs, all other crossovers as well as the larger Ford Mondeo, Vauxhall Insignia and VW Passat saloons and estates. Naturally, Hyundai, and their sister Korean brand Kia with their Sportage, want a slice of the lucrative crossover action. Other competitors include the excellent Peugeot 3008, the 2WD Ford Kuga, the new Mitsubishi ASX, the new Toyota RAV4, revised Suzuki Grand Vitara and the VW Tiguan. Hyundai UK have estimated ix35 sales of around 3,000 in its launch year and double that in a full year  all possible if the crossover market continues to grow as it has in the past 12 months. Hyundai said at the press launch earlier this year that 50% of ix35 sales would come from conquest customers, mainly younger families. They also thought that up to 90% would be for two-wheel drive versions but after the third bad Winter in a row I wonder how many new crossover owners have been sat at home, or stuck in the snow, in the last few weeks wishing they had opted for a four-wheel drive. With the new 20% VAT prices in place, the Hyundai ix35 line-up now starts at �16,540 and ranges up to �25,110 for a 'fully kitted' version. In the latest price list there are no fewer than 27 different derivatives of the ix35. Buyers can choose from Style and Premium specification levels; and Individual and Media Pack options can be added to the Premium models. Two new low-emission engines with intelligent Stop-Go have also just been added to the range: a 1.6-litre GDI (Gasoline Direct Injection) 111bhp petrol; and 1.7-litre, 108bhp, CRDi turbodiesel unit. The 2.0-litre 114bhp petrol unit introduced at launch has seemingly dropped out of the line-up but not the mainstay of the power units, the 134bhp 2.0-litre CRDi diesel unit, which remains. A six-speed automatic transmission option is available for the 2.0 CRDi models but only those with 4x4 traction. The Style spec can be chosen with all three engine options  the new 1.6 and 1.7-litre units (but only with two-wheel drive) and the 2.0-litre diesel version which is available with two- and four-wheel drivetrains. Premium models can be had with either 1.7 or 2.0-litre CRDi diesel powerplants but only the larger unit offers the all-wheel drive option. Having undertaken a brief 24-hour test drive in the ix35 back in February, the relatively quiet time of the year on the run-up to Christmas and the New Year holidays gives us motoring scribes the chance to take another, and longer, look at models that have proved to be significant newcomers during the year. Unfortunately I couldn't arrange to get my optimum choice  a four-wheel drive version  prior to Christmas, or either of the two new engines. Instead, a 2.0-litre CRDi 2WD Premium manual version arrived on my doorstep. Now priced at �20,930, it's probably the best seller in the range. Somewhat fortunately, my latest test drive of the two-wheel drive model had ended before the recent snow arrived. But sitting down now writing this update on the latest changes to the ix35 range and seeing deep snow out of my office window, I cannot help but think that four-wheel drive versions must surely be the most sensible buy. Ignoring the snow, in dry conditions they also handle better and feel more 'planted' on the road. True, snow and ice only last a few weeks but then we get rain and mud. All-wheel drive traction with the new generation, fuel-efficient, part-time four wheel drivetrains makes such vehicles practical both on or off the road and in keeping with their do-it-all design. Now, with the growth in summer UK 'staycation' holidays, active families need versatile go-anywhere transport with the ability to tow a boat, trailer or caravan (ix35's braked towing weight is 2,000kg). So why not pay the extra and have a four-wheel drive model? It really does make sense. But to get back to the ix35 in question... the longer spell with it confirmed my original view that its compact length (4.4 metres) with five seats, five doors and high-up command seating positions makes this a thoroughly modern and appealing purchase. The rising waistline and coupe roofline sloping down towards the rear limits rear-quarter visibility somewhat, and the rear seats do not fold completely flat for optimum ease of loading long items. Even so, the 591 litres of boot space (1,436 litres with the rear seats folded down) makes the ix35 a versatile load lugger whenever needed. Despite being designed and engineered in Europe, the ix35's ride comfort and handling qualities are not the best in this new segment and not a patch on the refinement offered by the Nissan Qashqai. The ix35 feels a tall vehicle during cornering and the suspension does not always absorb our poor bump and pothole-bedevilled roads. Although well equipped, the interior is durable rather than well finished but the layout and array of equipment is first class. Style versions come with 17-inch alloy wheels, ESP electronic stability programme, air conditioning, active head restraints, Bluetooth connectivity with voice recognition, heated front and rear seats, downhill brake control, electric windows front and rear, electric heated door mirrors with integrated LED-type side repeaters, six airbags, glove compartment with cooling function, 'follow-me-home' headlamp function, Hillstart Assist Control, leather steering wheel and gearknob, remote central locking with alarm, steering wheel audio controls, stereo-radio CD with MP3 and iPod connectivity, reverse parking sensors and a trip computer. Premium specification adds 18-inch alloys, a full-length panoramic glass sunroof, automatic headlights, chrome door handles, chrome interior trim, cruise control, dual-zone climate control with humidity sensor and ioniser, power-folding door mirrors, front windscreen wiper de-icer, keyless entry with engine stop-start button, rear privacy glass, rain-sensing wipers, part-leather upholstery and smart roof rails. All versions also benefit from Hyundai's enviable five-year, unlimited mileage warranty and a 10-year anti-perforation warranty in addition to their value-for-money reputation. The 2.0-litre, 134bhp/236lb ft turbodiesel engine is an adequate performer which officially returns 47.9mpg in the Combined Cycle. My two test drives with this version didn't get near that  37.8mpg for the short test and 38.2mpg for my most recent driving experience, both with the two-wheel drive option. I rather suspect that if the more sensible four-wheel drive was chosen for all-round and year-round convenience, the figure would be slightly less. For the record, four-wheel drive versions use an on-demand system. Basically, in normal use, the driving torque goes to the front wheels but a percentage of the power will automatically be transferred to the rear wheels when extra grip is needed on slippery surfaces or when towing. There is also a selectable 'Lock Mode' that splits the torque equally between front and rear axles and which can be used for speeds up to 25mph  off road or in deep snow, for instance. There is also Downhill Brake Control which limits the car's speed on steep descents such as when off-roading.